calliegibson | a future educators perspective…. I have created my summary of learning for ECMP 355. This class has taught me lots of valuable information that I will utilize in my teaching. Check out this video and give me some feedback! Here is my interview with my mentor for ECMP 355 Mr. Craig Frehlich. I have learned so much about the integration of technology into my classroom from Mr. Frehlich. This video really sums up how Mr. Frehlich integrates technology into every aspect of his teaching. I hope you all enjoy, its worth the watch!! After reading the blog post of a fellow ECMP 355 classmate, I am overcome with emotions. I only have one more week left at the University of Regina. This is the time I have been waiting for since I started this journey in September of 2010. Now that this final week is approaching I am finding myself wanting time to slow down. So many incredible friends and memories have been made through my four years of University. I have learned countless things about becoming a teacher and also about who I am as a person. The emotions I am feeling are a bit overwhelming. I thought I would be so excited about my last day of University classes however as the day approaches I am unsure of how my feelings will be. I would like to thank everyone who has been involved in this journey with me, my family, friends and everyone who has helped enhance my learning. It has been an amazing journey and as it comes to an end I feel extremely proud of myself. Congratulations to everyone graduating this year- we are the educators of the future and I know we will all do great things! I am just preparing to depart for the University of Regina Relay for Life which I am volunteering at. Thinking about the impact that cancer has had on so many lives around me makes me happy to volunteer for this great cause. Cancer has touched so many lives in such devastating ways. I am extremely excited to be able to be a part of the Relay for Life tonight. I hope that my contributions can help people who have been hurt by cancer. We are all participating in this wonderful cause for anyone who has ever been faced with cancer. It will be a night to remember and I am excited to have the opportunity to work with such wonderful people in volunteering at this event. If your not busy tonight come on down to U of R gym and experience the Relay for Life. I am sure it won’t be a choice you will regret. I worked on creating a capzle that can be used by upcoming teachers. This capzle contains resources that can be used within the Science classroom. Find my capzle at http://www.capzles.com/#/capzle-designer/?action=new! After working through this website I began to think of ways I could use this technology within my own classroom. I came to realize that the best way to use this technology in my classroom would be to get students to make a capzle about their lives. I would ask students to create a timeline that showcases specific events in their lives and why these evenst changed them as people. I think this would be a good way to get to know all of my students at the beginning of the year and would be a creative way that they could showcase themselves. I could easily assess these projects by having the students send me the address to their capzle. I think that using this technology would help engage students because it would be a more exciting way of creating a timeline than just writing one out on paper. I hope to be able to use this within my classroom in the future!!! As I sit here writing this post I only have 9 days on University remaining and 1 final exam. The emotions I feel around this are extremely different and exciting. I am excited for what is to come in my life, but at the same time I am sad about leaving this chapter of my life. University has taught me so many thing, it has not only taught me how to be a better teacher, but it has also taught me more about myself and my positive attributes as well as negative attributes. I am extremely excited for the upcoming chapter of my life where I will begin to work and make money, instead of always spending it :). I can’t wait to get into a classroom that is all mine and begin to start this career that I am so passionate about. Have a great Monday everyone! 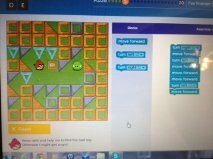 I chose to use the site http://csedweek.org/learn to learn about coding. This site had a tutorial which enabled me to learn about coding through angry birds. I enjoyed being able to create my own codes and begin to understand how coding works. This site was extremely user friendly and the video tutorials were excellent. As a teacher I would definitely use this within my classroom. I think that students would be extremely interested in doing something like this. This could be embedded into a science class to teach students the basics of computer science. I believe that you must use critical thinking to develop these codes. I even found myself questioning which way I had to turn at times while doing this activity. I also think that this activity would be something students would really enjoy as the world they live in is so technology based. I would use this site and the process of coding within my classroom to not only teach students about how computer coding works, but to also allow students who have an interest in technology to have the chanceto challenge themselves through this process.